The first Daring Cooks challenge for the new year is Thai Satay (set by Cuppy of Cuppylicious). I’ve made the Malay rendition of this street snack before, but never the Thai version so was excited to give it go. I tweaked the given recipe a little and added lemongrass, fish sauce, lime juice and sugar for a more authentic Thai flavour. They came out really flavourful and tender (marinating the meat overnight tenderises it). I’ve used chicken but lamb, beef or pork will work just as well. I paired it with peanut sauce (had a jar that needed using) but I think a lighter Nam Pla Phrik (a Thai Chili, Fish Sauce and cucumber dipping sauce) would have been a better choice. Cut off the woody top and very end of the lemongrass stalks and remove any tough,dried out outer layers. Chop the rest up finely and mix with all other ingredients (except the chicken) for the marinade. Cut the chicken fillets into small pieces and mix in a bowl or plastic bag with the marinade. Leave to marinate in the fridge for at least 2 hours or overnight. Soak the bamboo skewers for 20-30 minutes. 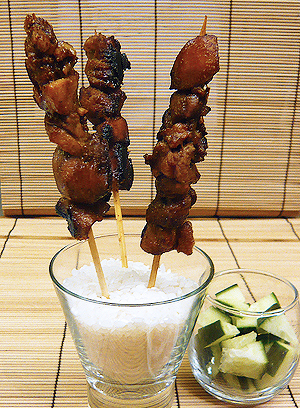 Make you satay by sliding the chicken pieces onto the wooden skewers, filling only the upper half of the skewer. Grill or broil in the oven on high for 8-10 minutes, until the edges begin to char then flip over and cook for another 5 minutes. You can also pan-fry them in a large pan on a medium high flame until charred then finished them in an oven set to 160°C (320°F). Serve with peanut sauce (or your choice of dipping sauce) and cucumber slices. ~ by gourmettraveller on January 13, 2010. Nice! We were disappointed with ours – we followed the recipe directly and found the flavour combination a bit cloying. Loved the tenderness that the marinade gives the meat though! I know what you mean, I think the lemongrass, fish sauce and lime juice did help brighten up the marinade somewhat but I would possibly consider omitting the ground spices altogether if I were to make it again. I read that some daring cooks paired it with a Nam Pla Phrik (chilli, fish sauce and cucumber dipping sauce) which I imagine would help lighten the taste of skewers as well. They look yummy, well done! Mmmm….satays! What an interesting way of presenting it. I love satays. It’s very popular in Malaysia. Great with the peanut sauce. Great job on your challenge and the satays look absolutely delicious. Looks good! I love Asian tastes! I’m glad you changed the recipe to suit your tastes. It was more of a guideline on a first marinade, and you snatched that right up. Excellent! What a great presentation, too! Gorgeous! I am digging the way you served your skewers. When your blog loaded, for a second I thought mine had loaded by mistake. Great minds I guess. I guess so! Your polenta and egg looks amazing (I must try it some time) and the Cuban Pig is seriously impressive! I love the presentation of this dish. It looks mouthwatering. I love chicken Satay, great presentation! Love your presentation and yes I did some changes in the recipe to make it more “Thai”. Super work on this challenge. Cheers from Audax in Sydney from Australia. Love your idea of sticking the skewers into that glass full of salt. Creative!